While California struggles to find enough affordable energy and water to meet its needs, agribusinesses in the Central Valley are getting taxpayer-funded power subsidies worth more than $100 million a year to transport irrigation water, according to an Environmental Working Group (EWG) investigation that calculated, for the first time, federal power subsidies given to each of the almost 100 water districts in the Central Valley Project (CVP). 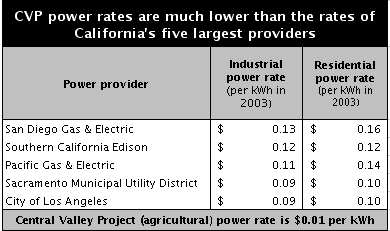 EWG calculated power subsidies in the CVP for the years 2002 and 2003 by comparing the electricity rates Bureau of Reclamation charged agribusinesses to those charged by Pacific Gas & Electric (PG&E), the major power provider in the CVP service area. CVP agribusinesses paid only about 1 cent per kilowatt-hour (kWh) of electricity used to transport irrigation water. One CVP water district gets more power subsidies than all others combined: Westlands Water District. In 2002 alone Westlands got more $71 million in power subsidies Ð an average of $165,000 per farm to a district that includes some of the nation's biggest and richest agribusinesses. Federal power subsidies come on top of federal water and crop subsidies worth hundreds of millions more dollars each year. All told, the annual federal subsidy to CVP farms easily exceeds half a billion dollars, and could well top $1 billion. 1According to the Department of Energy, in 2005 the average per capita residential electricity consumption in California was 572 kWh per month. 2Comparison to five largest power providers was only conducted for 2003 due to data availability.